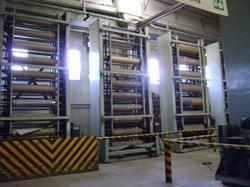 We are highly occupied in providing Colour Rotogravure Press to our respected customers. It manufactured at modern premises under the supervision accomplished experts in tune to the sector predominant standards. The offered product is accessible in various options to choose from. Apart from this, we are offering these products at pocket friendly prices to our esteemed clients. This product can be used as a unit of a plastic film blowing machine or a flex printing machine. Looking for Colour Rotogravure Press ?